Tonight I am posting an old one, so old in fact that I don’t remember when I drew it. I had as always fully intended to create something new for tonight, but we are having friends come for dinner, and we have hardwood floors and cats, and worse yet the Ghost of Christmas Crafting is still in the house. Glitter in every crevice of my hardwood floors. One of my dinner guests is a former Marine, I’m not sure he would appreciate leaving my home sparkling. I cleaned for about four hours, shopped, cooked and baked. Needless to say I’m tired, but I’m also out of time, they will be here in a half hour. 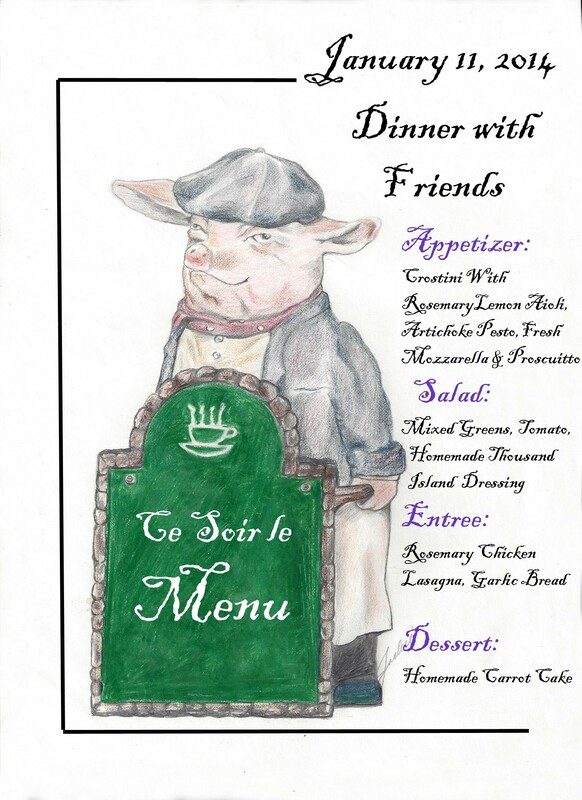 I was organizing some of my work today and came across this drawing, as I said its been around for a while, but I mentioned a few weeks ago about my plan to do menus for special occasions, and here one is. These are guests that I promised dinner to a year ago. Yikes! What a year, but a promise is a promise, and I really do enjoy their company. So for tonight I combined my old sketch with my new plan, and I have to say I am quite happy with it. I’m off to final preparations, and for once to try to be ahead of the game and relax and enjoy my evening. In case you were wondering, I came through yesterday’s hike with flying colors, nary a pain in sight. We will be going again in the morning, hopefully with the same results. This entry was posted in art, Art and my life, Drawing, Fine Art, Friends, Humor, Uncategorized, Words, Writing and tagged art, drawing, Fine art, Friendship, humor, illustration, life, Paper, pencil drawing, projects, thoughts, Visual arts, writing. Bookmark the permalink.